C41/P2505 No voltage is applied to the ecm. 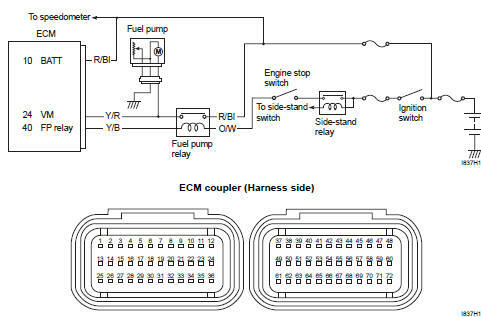 Lead wire/coupler connection of ecm terminal to fuel fuse. Remove the front seat. Refer to “exterior parts removal and installation” in section 9d . Check the ecm coupler for loose or poor contacts. If ok, then measure the ecm input voltage. Insert the needle pointed probe to ecm coupler. Measure the voltage between terminal “10” and ground. Fuel pump relay circuit malfunction. Refer to “dtc “c41” (p0230-h/l): fp relay circuit malfunction” . 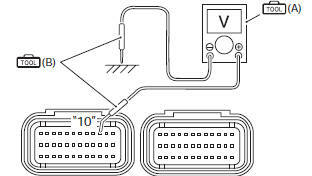 R/bl wire open or short or poor “10” connection. Power source of speedometer shorted to the grand or open. Open or short circuit in the r/bl wire.